Since Inauguration Day, the streets of US cities have been filled with protesters. 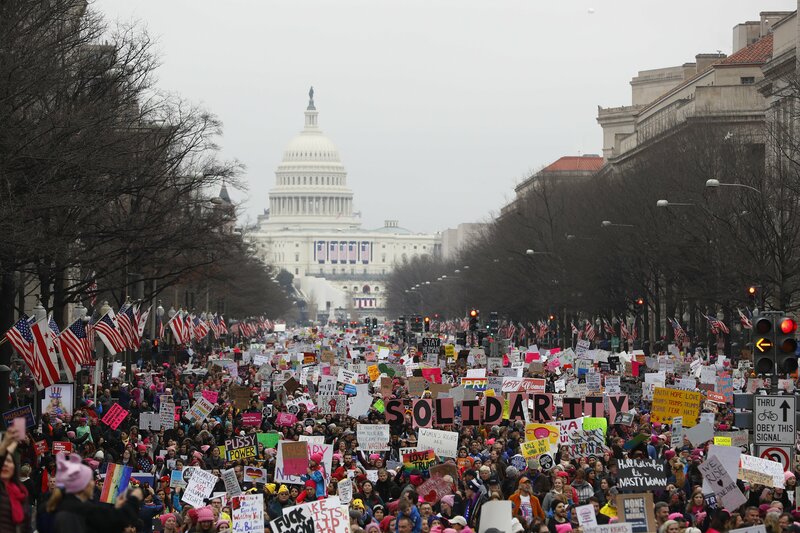 Major demonstrations are being planned to follow up on the hugely successful Women’s March. Environmental, science, human rights, media, foreign affairs, and privacy groups are redoubling their efforts to organize and raise money. Ordinary folks like you and me are asking ourselves, What can I do? To rephrase an old line, we need to think nationally, act locally. Here are snapshots of how many different people are fighting back where they live and work against the assault on democracy and social justice of Donald Trump and his band of super-wealthy. We are not going to allow one election to reverse generations of progress at the height of our historic diversity, scientific advancement, economic output, and sense of global responsibility. . .. While Donald Trump may have won the presidency, he hasn’t changed our values. America is greater than any one man or party. We will not be dragged back into the past. We will lead the resistance to any effort that would shred our social fabric or our Constitution. California was not a part of this nation when its history began, but we are clearly now the keeper of its future (http://sd24.senate.ca.gov/news/2016-11-09-joint-statement-california-legislative-leaders-result-presidential-election). Someday that statement may merge into a declaration of independence! But in the meantime, Governor Jerry Brown is making California a world leader in tackling climate change. There are about 100 US cities and counties that are sanctuaries for immigrants in the US illegally and subject to deportation. They plan to defy Trump’s planned use of the Immigration and Naturalization Service to intimidate and harass immigrants (www.nytimes.com/2017/01/25/nyregion/outraged-mayors-vow-to-defy-trumps-immigration-order.html). The Washington Post reported on January 19, 2017 that in 168 counties where most illegal immigrants live, 69 will resist federal requests to hold them in jail, while 99 will accede to the requests. The mayor of Minneapolis said on national television that the large Somali community living there is an asset to the city, not a source of problems as Trump insisted when he visited during the campaign. Likewise, the mayor of Santa Fe, NM said his city would remain a sanctuary and not do the work of federal police in identifying and removing illegal immigrants. These mayors, and mayors in Chicago, New York, Los Angeles, San Francisco, New Haven, Syracuse, and Austin, are also defiant. They anticipate cutoffs of federal funds for various city projects; but they all said they would find other ways to finance programs. According to the New York Times story above, the president and Congress actually have limited ability to reduce or eliminate federal funding to cities and counties. But San Francisco isn’t holding its collective breath: It is suing the federal government, arguing that Trump’s order to cut off funds from sanctuary cities is unconstitutional. New York State has recently proposed legislation to require that all presidential candidates must reveal their tax returns; otherwise, candidates cannot appear on its ballot. (Sen. Elizabeth Warren has proposed the same.) Katrina vanden Heuvel reports: “A coalition of mayors from across the country—including New York and Los Angeles but also cities throughout the Rust Belt and the South—are already coordinating to fight Trump’s deportation plans. Local Progress, a national network of city and county officials, is working to protect civil rights and advance economic and social justice (www.washingtonpost.com/opinions/three-steps-for-progressive-resistance-and-rebuilding-as-trump-era-launches/2017/01/03/c52908d8-d112-11e6-a783-cd3fa950f2fd_story.html). As Trump’s executive order banning immigration from Muslim-majority countries makes its way through the courts, sixteen states have joined Washington and Minnesota in seeking removal of the ban. Meantime, Reuters (November 18) reported that attorney generals in Maryland, Virginia , Washington, Massachusetts, and New York have said that should the Trump administration seek to weaken consumer protection or climate change policies, they might ask a federal judge to block federal action nationwide. We’ll need to help defend our communities from attacks, deportations, and more. We’ll need to help fuel a mass movement that’s almost unprecedented in modern memory—one that’s capable of stopping the incoming Trump administration and its allies in Congress from upending the fundamental values of inclusion and diversity that have made our country strong. We’ll need the sharpest legal and procedural strategies available—which means starting research, consulting with relevant experts, and planning with key allies inside Congress and those who have served in the executive branch. Government workers were reportedly rising to the Trump challenge immediately after the election: “Officials in the US military, intelligence services, diplomatic corps and federal law enforcement have told the Guardian that Trump’s suggestions [on use of torture and barring of Muslims] represent such a departure from the norms of American governance that they are contemplating internal resistance or a career change” (www.theguardian.com/us-news/2016/nov/11/national-security-shift-us-policy-trump-presidency). Now, these same people are looking for ways to express their opposition to Trump without risking loss of their jobs: www.washingtonpost.com/politics/resistance-from-within-federal-workers-push-back-against-trump/2017/01/31/. Already, “the entire senior level of management officials” at the State Department has resigned, “part of a mass exodus of senior foreign service officers who don’t want to stick around for the Trump era” (www.washingtonpost.com/news/josh-rogin/wp/2017/01/26/the-state-departments-entire-senior-management-team-just-resigned/). Over 1,000 State Department officers have signed a “dissent channel” protest against Trump’s immigration order, prompting Sean Spicer, Trump’s press secretary, to warn: “Either get with the program or they can go.” And 100 former senior national security and foreign policy officials have condemned the order in a letter to Homeland Security (http://lobelog.com/letter-from-100-plus-national-security-leaders-on-refugee-executive-order/#more-37769). Trump’s firing of Acting Attorney General Sally Yates on January 30 for failing to implement his immigration order may be the tip of the iceberg, for no doubt there are other long-time professionals in the AG office who feel betrayed by Trump’s lawlessness. I use “betrayed” because that is the word Trump used to justify the firing: When the shoe fits, wear it. I also expect to see scientists who staff the Environmental Protection Agency and other government units concerned with climate change speak out in coming months as the Trump administration tries to silence factual reporting. There will be more James Hansons. Meantime, how about kudos to the 60 young scientists, hackers, and librarians who converged at the University of Pennsylvania a week before the inauguration to save EPA and National Oceanic and Atmospheric Administration data from being expunged or altered by the Trump team (www.wired.com/2017/01/rogue-scientists-race-save-climate-data-trump/). The crucial data on climate change will be sent to a repository hosted by Amazon Web Services. Legal challenges to Trump’s business conflicts of interest have begun, with a distinguished group of lawyers and government ethics specialists bringing suit on the basis of the so-called emoluments clause of the Constitution (www.citizensforethics.org/press-release/crew-sues-trump-emoluments). Whether or not this effort succeeds, there are a reported fifty lawsuits already filed to bring the Trump administration to heel. Quite a few major corporations have, in one form or another, expressed opposition to Trump’s immigration order. Credit should go to their employees and not necessarily to corporate leadership. Companies include Uber, Starbucks, Google, Lyft, Saxlesforce, Twitter, Coca-Cola, Nike, airbnb, Microsoft, Amazon, Expedia, Netflix, and Apple. (Here, for example, is Timothy Cook of Apple to his staff: “In my conversations with officials here in Washington this week, I’ve made it clear that Apple believes deeply in the importance of immigration — both to our company and to our nation’s future. Apple would not exist without immigration, let alone thrive and innovate the way we do.”) Even the Charles Koch Foundation, no friend of Trump but a huge supporter of conservative causes, has come out against Trump’s executive order. A New York Times survey has found, finance, media, and manufacturing companies have generally not responded with concern or criticism (www.nytimes.com/interactive/2017/business/trump-immigration-ban-company-reaction.html). A strange exception is, of all places, Goldman Sachs. Bigotry has galvanized many universities into resistance. My own former institution, Portland State University in Oregon, is a sanctuary campus. The university president announced it was dedicated to diversity and safety, and would not cooperate with immigration authorities. Many universities have done likewise. The public controversy and legal debate over the President’s order is intense. Among the many strong petitions and compelling statements that have been issued is one from the Association of American Universities (AAU), of which Columbia is a member. We join with many peers in decrying this action as discriminatory, damaging to America’s leadership in higher education, and contrary to our nation’s core values and founding principles. At a more fundamental level, this order undermines the nation’s continuing commitment to remain open to the exchange of people and ideas. We must not underestimate the scale of its impact. An estimated 17,000 international students in the U.S. are from the seven nations covered by the entry ban. Scholars planning to travel to the United States for meetings and conferences at our colleges and universities will effectively be barred from attending. If this order stands, there is the certainty of a profound impact on our University community, which is committed to welcoming students, faculty, and staff from around the world, as well as across the nation. I am deeply concerned about this decision. This is not only unbefitting a country built by immigrants on the ideals of liberty and equality, but it is also a self-inflicted wound that will damage the very innovation that lies at the root of our nation’s prosperity. For an ongoing list of universities that oppose Trump’s order, see http://ihec-djc.blogspot.com/2017/01/running-list-of-universitycollege-and.html?m=1. And let’s not forget that our Canadian academic friends are also upset, and supportive of resistance. Numerous universities have issued statements condemning Trump’s policy. Some Canadian universities have even offered temporary residence to Muslim university students in the US. Let me be clear. This type of behavior is abhorrent and will not be tolerated at UW Bothell. This is not only a violation of the women’s right to practice their faith, it is also a clear violation of our values at UW Bothell. In addition, such an act may be potentially a criminal assault, and a hate crime. This is a serious offense. We will not tolerate this kind of behavior. You should not tolerate it either. Pushback on Trumpism is being reported from just about everywhere. Mexico’s president canceled his visit to Washington as Trump, showing total disregard for relations with our neighbor, pushes ahead on his wall project. In Britain, 1.6 million people have signed a petition calling for the government to withdraw PM Teresa May’s invitation to Trump to make a state visit, which ordinarily would include a speech before the House of Commons. Here’s one other much smaller example that struck me, as a former Fulbrighter. About 2000 Fulbright Award winners, mostly those abroad, signed a statement upholding tolerance, free speech, and the importance of international exchanges of students and scholars. They denounced the president-elect who, during the campaign, “openly engaged in demagoguery against a number of vulnerable populations, courted hate groups, threatened the press, and promised vindictive actions against his opponents. This is not populism; it is recklessness.” The statement took particular aim at Trump’s campaign threat to end J-1 visas, which could end the Fulbright program’s ability to bring foreign students and scholars to the US (http://www.huffingtonpost.com/entry/an-open-letter-from-1500-fulbrighters-regarding-the_us_582b14aee4b02b1f5257a91b). -Harassing the hell out of Members of Congress! The effort has inspired a yard sign whose popularity has grown more quickly than even the proliferation of post-election presidential protests on Portland streets. The 22-x-14-inch sign depicts an American flag, illustrated with a variety of social values in red, white and blue, such as: “all people are equal,” “black lives matter” and “people & planet are valued over profit.” Available for $10. www.oregonlive.com/portland/index.ssf/2016/12/social_values_mix_with_america.html. At this very early stage, one thing that is needed is buzz. Impeachment has to become part of the lexicon and an approach that people begin to consider as a viable and timely pathway. One way to generate buzz and awareness is to begin seeding op-ed columns with short (<600 word) opinion pieces discussing and suggesting impeachment as a course of action. If you like writing, this may be for you. The op-eds need not be placed in the NY Times or the Washington Post to do the job. If they are published in smaller, regional papers, and especially if enough individualized (not mass produced) opinion pieces appear over a short space of time, the news services and aggregators will begin to take note and do their leveraging magic. Obviously a paper with a very pro-Trump editorial policy is less likely to accept an impeachment piece than one with a more progressive tilt. Also take a gander at the paper’s procedure for contributed opinion pieces to narrow down your choice. Some papers fill their opinion pages with syndicated columnists; others are quite open to contributed pieces. Length limits vary.) https://en.wikipedia.org/wiki/List_of_newspapers_in_the_United_States#By_circulation. Op-ed pieces need not be placed in your home town newspaper. I doubt that being a subscriber or having a local address scores that many points on a national political story like this one. · I read papers and magazines from around the US and around the world that have a high level of credibility. I reject sources that are too slanted or opinion-heavy. · I look for issues that put our constitutional freedoms at risk. · I look for actions to oppose anything that puts our freedoms in jeopardy. I fact check the sources to be sure they’re trustworthy. · I organize these and email them to you once a week. Jennifer writes that when you sign up you’ll get a weekly email with specific actions to take backed by good research. This is your greatest so far! There will be a march, or many marches, of scientists in support of the need to maintain science-based assessment in our future, and to resist political marginalization of science. 2017 Earth Day. If Trump is unable to restrain himself–and there is little indication that he can–these widely dispersed oppositional energies will need to converge on the House of Representatives, the 2018 elections, and a bill of impeachment.